( WOW WHAT A JAM PACKED SHOW. 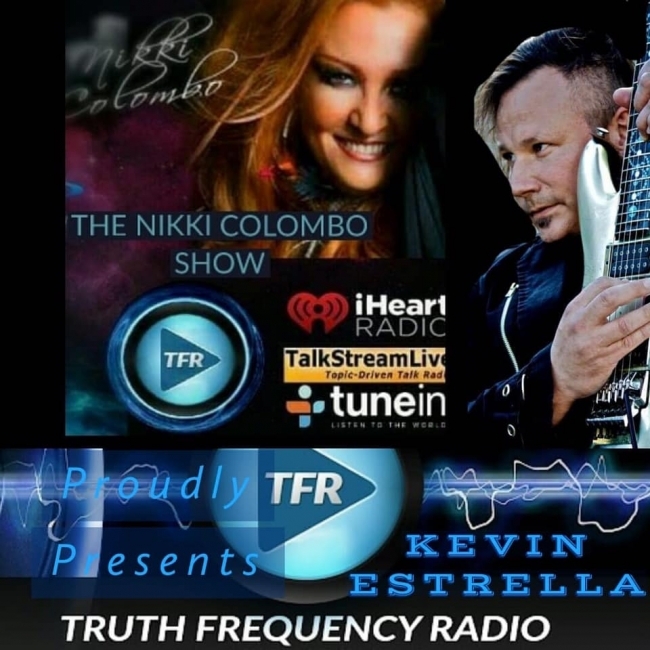 Special guest ET Contactee Kevin Estralla gives us an exclusive listen to his tonal music through telepathy from the whales Kevin discusses the ‘Edge of the Black’ where music inspiration comes from. And the ‘Tonal Language of the Cetaceans.’ The Whales  and Dolphins . He also shows us how to make contact with The Star Nations on Twitter and tells us funny stories with benevolent ET’s. Kevin Estrella has been welcomed deep into the UFO community after having his own first-hand encounter with something not of this world. He has been a featured guest on over 40 UFO radio talk shows. Kevin is the guitarist and composer of the instrumental rock band Pyramids on Mars. A combination of elements of hard rock, industrial, and metal infused with lead guitar melodies inspired by violin melodies of Baroque classical composers J. S. Bach and Antonio Vivaldi. Kevin has always had a passion for UFO’s, Extra-terrestrials. He spent over 20 years researching to understand why they are here. Kevin wanted to combine his passion of music with raising consciousness and awareness of the UFO and Extraterrestrial presence. He felt it was always his purpose in life. This calling was affirmed on August 21, 2014, when he had contact with an inter-dimensional craft of unearthly origin. Since then Kevin began experiencing many other related incidents like incredible synchronicities, music downloads, symbol downloads through dreams (Neck Illusions DNA Double Helix design on his guitar), and increased Telepathy. His musical downloads are discussed in UFO Researcher Grant Cameron’s book “Tuned In: The Paranormal World of Music.” Many of Kevin’s personal CE5 encounters are discussed in “Inviting ET” by Su Walker. Kevin has become very involved with Sandia Wisdom on Twitter, Extraterrestrials using Twitter, who reside in a complex under the Sandia Mountains of Albuquerque NM. He works very closely with the Sandia ETs. Sandia has given Kevin several ‘upgrades’ and downloads and has visits from them on a weekly basis.